Tulle is one of the most versatile materials available to event planners and individuals organizing a large gathering. Our tulle package includes a total of four bolts (equal to 200 yards) of gorgeous diamond tulle. This 108" wide length gives you plenty of decorative options so you can do it yourself or dress up the venue in the wispy elegance of this beloved fabric. The reason tulle is so appealing is because it is flexible and visually stunning. The surface is formed out of a single layer of dainty netting. At a distance, the small gaps and fibers create a charming texture that has an almost ethereal quality. Our tulle is perfect for almost anything! Sew a veil for yourself, a loved one or customers. Cut the tulle into circles to use as small favor sachets. A long piece can be gathered together and draped in front of tables or alone walls and railings. You can even apply smaller pieces to go around the cake, wishing well or any other area that demands guests' attention. We offer many handsome colors that can give the tulle a unique personality that matches your event. Click the dropdown box above or link beside it to see the entire list. Work with hot pink, red, yellow, purple, lavender, butterscotch, stone, Kelly green, black, aqua blue and many more hues. One bolt of tulle can go quite a long way when planning a wedding or any other important celebration. We guarantee that you will be 100% satisfied with our tulle. We encourage you to request a free tulle sample before ordering. 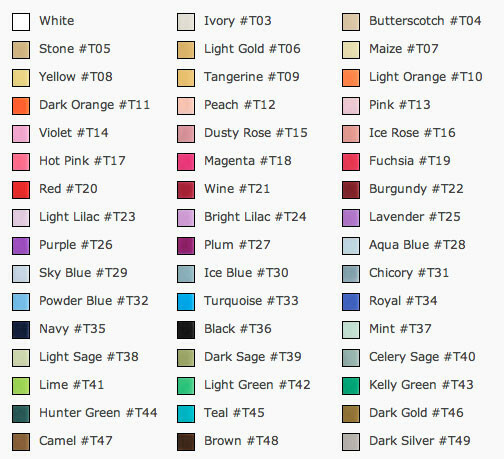 Color swatches on the web site may vary slightly from the actual fabric color.